Flow Meters are utilised for monitoring of the fluid movement in both cased and uncased boreholes. The HF-500 Flow Meter of W&R production is able to measure vertical flow volumes in range of Q between 20 and 40 ml/sec. For measurement of vertical flow volume lower than 20 ml/sec the HRTFN 381 probe can be used. The HRTFN 381 probe is a multi purpose tool, which utilizes color-signing technique. The Flow Meter Modular Set HF-380 is suitable for measurement of flow volumes higher than 60 ml/sec. 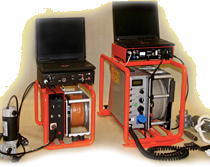 The HF 500 is designed for measurement of parameters of liquid vertical movement. Both velocity (W) and flow volume (Q) can be measured. There are two ways of measurement: a dynamic one and static one.